I have just upgraded my xcode version to 5.0. After running application 2-3 times it's giving me error like this "iOS Simulator failed to install the application". This is working fine in old xcode. When I reset the simulator it works fine, but this is irritating again and again. Can anybody tell me what is the real issue? How can i resolve it. Did you find new solution for this thing? 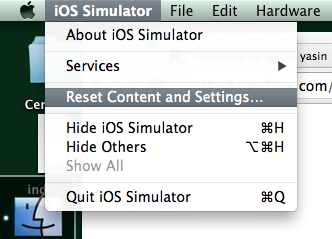 Try manually launch the iOS Simulator and from the "iOS Simulator" menu, click "Reset content and settings", then close and rebuild your app. It worked for me. click "Reset content and settings"
close simulator and rebuild your app. I think this works for you...!!! I just used CMD+SHFT+K and quit the simutor and then run again and it's working, no need to reset simulator or delete an applicaiton.I'm not sure but some time it will work. Just delete the application from the simulator and build it again. Or try to use a device with different iOS version. Not the answer you're looking for? Browse other questions tagged objective-c xcode xcode5 or ask your own question.